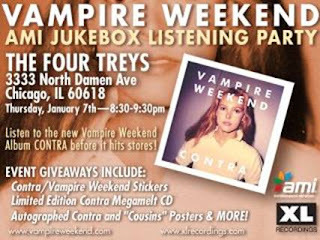 Anxious to have a listen to the sophomore Vampire Weekend record, Contra, before it's officially released on January 12? Then head to The Four Treys (3333 North Damen Ave.) at 8:30 p.m. on Thursday, January 7 for a listening party hosted by AMI Entertainment Network. Not only will you get to hear the new tunes, you'll also have the chance to score prizes and giveaways such as autographed posters, a limited edition CD and stickers. For additional details, check out the flier to the right. 08 "Giving Up the Gun"
10 "I Think Ur A Contra"
Visit the band's official site to listen to the album's first single, "Cousins,"and download another new track "Horchata," for free here. Click here to pre-order a copy of Contra.